We showed you 3 awesome banners yesterday for The Hobbit: The Desolation of Smaug. Now check out two more. The first is of our favorite wizard, Gandalf the Grey, played by the amazing Sir Ian McKellen. This second poster shows the familiar face of Legolas, played by Orlando Bloom, fighting alongside the female elf specifically created for the film, Tauriel, played by Evangeline Lilly. Don’t forget to check out the newest Hobbit trailer, that hints somewhat of a stirring of feelings between the two. 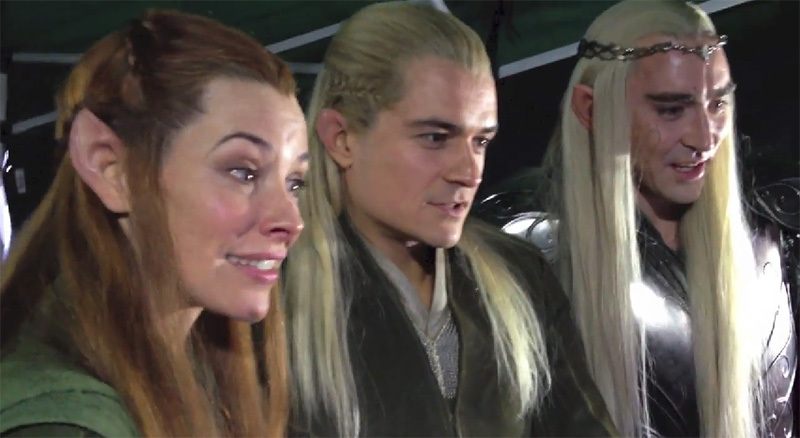 In a delightful turn of the table, actors Lee Pace (Thranduil), Orlando Bloom (Legolas), and Evangeline Lilly (Tauriel) give their reaction to a reaction video of two of the staff members from TheOneRing.net, Kili and Fili. Not only that, but the actors do so while in costume! Thanks to Peter Jackson for filming it. 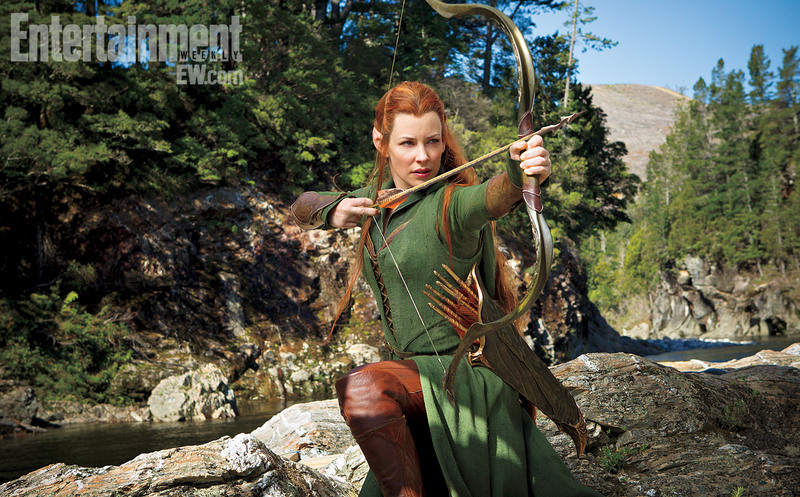 Entertainment Weekly has an exclusive first look at Evangeline Lilly as the elf warrior Tauriel! As previously reported, Lilly will be portraying the character who is being introduced in the second installment of the Hobbit trilogy. When The Hobbit: The Desolation of Smaug hits theaters on Dec. 13, there will be a fresh face among the residents of Middle-earth: Tauriel, an elf warrior played by Evangeline Lilly ofLost fame. “She’s slightly reckless and totally ruthless and doesn’t hesitate to kill,” says Lilly. She’s also not found anywhere in J.R.R. Tolkien’s original fantasy novel, or in any of Tolkien’s other writings for that matter. Even though you’re not familiar with her character from the book (because she’s not in it), what do you think of the still? Let us know! Evangeline Lilly is most famous for playing Kate Austen on LOST, but she is hoping to reinvent herself through the much-talked-about Hobbit character, Tauriel. She sat down with TotalFilm.com and dished about Tauriel and her expectations for the Hobbit’s second feature, The Desolation of Smaug. You can read the full feature inside the issue, but here’s a sneak peek at what Lilly had to say about playing Peter Jackson’s woodland Elf, Tauriel. Since Tauriel is a created character NOT in the books, you’d have to think she will be polarizing. Will she capture audiences the way Liv Tyler did in the Lord of the Rings films, or will her character be determined useless and hurt the franchise’s image? There is a lot at stake.